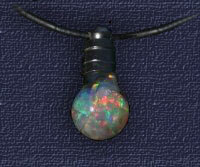 Genuine Opal Pendants and Jewellery by Laszlo's Opals and Jewelry. Opal Pendants by Laszlo's Opals & Jewelry. Australian Opal Necklace and Inlay Jewelry Specialists! You have 0items in your shopping cart. Laszlo has been a designer and manufacturer of opal pendants for more than twenty years. Opal necklaces are a unique form of opal jewelry that allow creative designs to be built around conventional or unusually shaped opals. The result is a truly unique, one of a kind necklace or pendant. 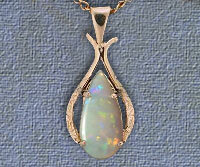 Our opal pendants and opal jewelry products are priced well below our retail competitors. Compare our prices and see for yourself. How do we do it? Simple - all of our products are manufactured in-house and we do not have the added overheads of a retail outlet. By selling direct through our website we offer real value for money. The opal pendants on this page feature solid opals set in gold and silver, opal inlaid into your choice of sterling silver or gold and opal doublets mounted in gold. All of our pendants and jewelry prices include insured airmail delivery. Click the links on the left hand side of the page for complete delivery, currency conversion, ordering and other information (scroll down to see all links). If you have a design idea for a custom opal pendant or item of jewelry, please let us know and we can design and manufacture it for you at an excellent price! We can work from sketches or descriptions. 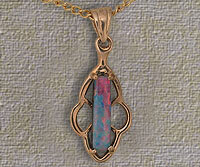 This opal pendant has a red opal solid mounted in a 14k yellow gold setting. The opal weighs 1.95 carats. The pendant measures 25mm. This opal pendant has a multicoloured opal doublet mounted in a 9k yellow gold setting. The pendant measures 29mm. 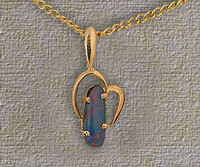 This opal pendant has a blue red opal doublet. It is mounted in a 9k yellow gold setting. The pendant measures 21mm. This pendant is made by suspending crystal opal chips in a glycerine solution encased in pyrex with a stainless steel cap. Supplied with a leather strap, a plated chain is available on request and is popular among our younger customers or those looking for an unusual gift. The pendant measures approx. 20mm high. With each pendant purchased, we supply a complementary display chain that should be replaced by a solid gold chain of your choice. Please feel free to email for information on other types of chains and we will endeavour to supply to your requirements. Polished opals are weighed in carats. 1 carat = 1/5th of a gram. (1 gram = 5 carats). All prices include complimentary insured Airmail delivery. For priority delivery, please see the options in our order form. Prices shown are in Australian dollars. To convert Australian dollars to US Dollars or any other currency, please click the currency converter link. All prices include freight via insured airmail for international customers, or registered mail for Australian customers. on 61 8 7226 2943 if you need further details. Listed prices do not include GST, which is added to your order automatically at the checkout.